Lately I have actively been loving my dog. For all his cons (stubborn, barky, cat chaser) he has a lot of pros (snuggly, loyal, friendly). As he's gotten used to our life more things come to light. Whenever I stop on the street to talk to someone or root around in my bag or take a picture he sniffs for a few moments then waits patiently on a slack leash. This makes him, frankly, about the perfect photographer's dog. Today I had my camera with me while we walked and I realized it was a perfect chance to get something for the Aiming Low photo challenge this week. They are much stricter than I am. You have to take your shot in the week of the challenge. The prompt was "April Showers Bring May Flowers" so I toured the neighborhood snapping nice but kind of boring pictures. 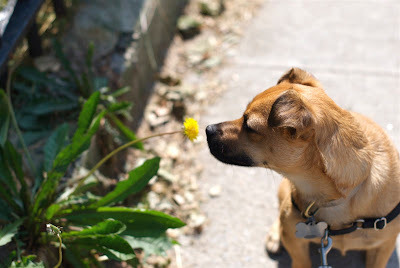 Turning the corner toward home I saw a lowly dandelion and thought, "Well, no one will share one of those." The dog loitered quite nearby. I still felt the shot was kind of boring so, just for fun, I called him over and had him sit. While I fiddled with a setting and framed a shot he did his thing. After 4 or 5 clicks of the shutter he did this all on his own. This one to print and frame. Yup. Framer. Ohhhh Eddie. Delicious little Eddie! Yes, perfect - and what a good boy he is. Jack is a terrible model. He always moves before the shutter does. Awww. What a great picture! Thanks for sharing the awesome with us! your sitemeter is going to record eleventy million hits from OKC. It's me. I love this picture with my whole heart. It's nice to see a dog just being dog in a polite way in a very human based city. Nice work, Eddie!